In an age where gyms and yoga studios have become the new place of worship, and health and wellness is a billion-dollar industry, the desire to live well and eat healthy are undeniable. This desire has created a demand for products that reflect that lifestyle change, including the way we drink. The sober revolution which is stirring has called for innovative distillers to create sophisticated alternatives. 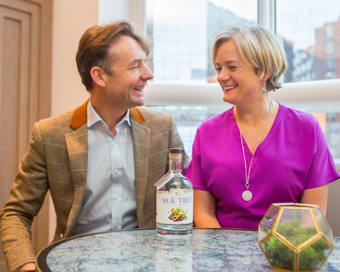 One such brand is Silk Tree, who have created Ireland’s first non-alcoholic spirit. Launched by husband and wife team Andrew and Tracy Oates, who conjured up the idea of an alcohol-free spirit after taking a challenge to quit alcohol. Not wanting to ostracise themselves on social occasions, they explored what options were available but were left unimpressed with the sugary, fizzy drinks on offer. They decided to get to work on creating a full-bodied alternative that could arouse the same degree of satisfaction as their favourite gin and tonic. After months of experimenting with different ingredients and testing it on family and friends, they finally came up with a formula that tasted so good they thought they should bottle it. Distilled in Old Carrick Mill in Co. Monaghan, the spirit is made in the traditional way in a copper still, blending cinnamon, juniper, coriander seeds and lemon verbena to create Silk Tree. It has a smooth as silk texture on the taste buds and a warming sensation when it goes down, akin to alcohol, with a citrus aftertaste. With its bold flavours, Silk Tree can be enjoyed neat, simply with tonic a slice of lime, or mixed into cocktails such as a Hot Toddy or a Margarita. The Silk Tree founders are on a mission to change the perception of sobriety – not drinking is often reserved for Sober October and Dry January, conjuring up images of quiet nights in and making excuses for dinner invitations, but Silk Tree aims to take away some of the social pressure associated with going sober. Our duo have created a sophisticated alternative to drinking alcohol. Silk Tree is currently being made in small batches, all ingredients are responsibly sourced and there are no sugars or preservatives added. Silk Tree is a totally natural product with only 12 cals per 100 ml. There is a minute trace of alcohol added, less than 0.5%. This is only added as it helps draw out the flavours of the botanicals and spices. We are reassured to hear that there is more alcohol in your mouthwash!